MEET OUR AMAZING ECLIPS STAFF! We can't wait for you to get to know us. And we can't wait to get to know you, too! Sheila has been a member of the professional beauty industry since 1987, and joined the Eclips team in 1990 as a professional Hair Stylist. Sheila attended the U.S. Beauty Academy and has completed training and certification in Tony & Guy Advanced Academy of Hair-color and Haircutting, Goldwell Advanced Hair-color, Vidal Sassoon Advanced Haircut & Hair-color, EasiHair Pro extensions and Coppola Hair Straighteners. She is Goldwell certified and specializes in styling curly hair and providing both classy and trendy cuts along with color correction and perms. She’s received awards and honors including Highest Client Retention and Best Hair Stylist in Area. Sheila has been published nationally as a Hair Stylist in Celebrity 101 Hairstyles and Sophisticate’s Hairstyle Guide magazines. Her goal is to make sure her clients feel good about themselves, feel beautiful and leave her chair with enhanced self-confidence. Patti is our newest team member at Eclips and is bringing 30 years of styling experience from a leading salon in Georgetown. A Virginia resident, Patti is excited to move her work closer to home and a more accessible place for DC metropolitan area customers. She specializes in dimensional one process color, and highlights. Patti has created long-lasting relationships with her clients and hopes to build on her current base at Eclips. Her listening skills and careful attention to detail are what makes her haircuts special! She is determined to help her clients create a hairstyle that is functional and manageable to fit their everyday lifestyle. It is important to Patti that each client leaves happy with their new look. She is excited to join the Eclips staff and bring her signature touch to McLean! Cassie started her professional Stylist career in 1980 after attending Bon Joo Beauty Institute, Japan Beauty School and having worked at the Park Joon Mijang Beauty Salon. She came to the United States from Korea, joining Eclips Salon & Day Spa in 2000. She specializes in creative highlights, lowlights, hair-color artistry and providing trendy fashion forward hair designs. Cassie has been nationally and internationally published as a Hair Stylist in Celebrity 101 Hairstyles, Hairstyle and Salon Today magazines as well as in Passion Hair-color, Passion Up-styles and Bridal Style books. Cassie is always striving to learn new and exciting techniques and hairstyles to keep each of her clients happy and trendy. Cassie always respects her clients’ valuable time and their expectations when creating an individualized style and look. Fary has been in the hair styling business since receiving her license in 1998. She is an expert in hair cutting, coloring, highlighting, corrective color and special occasion styles and updo’s. She also specializes and is certified in Thermal hair straightening, Coppola treatments, Grund hair straightening, and extensions as well as EasiHair Pro extensions.Fary is always smiling and loves the rewards of seeing her clients smiling in return. Laura has 20+ years of experience working with several hair types and textures over her career. Laura’s personal goal as a hairstylist is to listen to her clients’ specific needs and wants to give her individual clients a unique look specific to them. She takes great pride in what she does and always provides exceptional service. She has experience with both men and women’s hairstyles, including wedding styles. She specializes in and has a wide range of skills, and has been written up in the Northern Virginia Magazine. Her technical skills and her education have assisted her in mastering various color and cutting techniques. Laura is certified in Japanese straighteners, Keratin treatments, EasiHair Pro extensions and is also a Deva Curl stylist. Laura consistently increases her skills and education by attending new courses on a regular basis. In addition to her training and skills, she is a mentor to Nawel, one of our junior stylists, to help build her skills to advance to being a full time stylist. Stanley has 13+ years of experience as a hairstylist. After graduating from the Paul Mitchell School in 2000, Stanley worked for Paul Mitchell as a hairstylist until 2003 and then became an educator to increase his career path and expertise. From 2004 to 2006, Stanley studied at Vidal Sassoon and worked there until 2010 before joining the Eclips team. Stanley specializes in scissor cutting for both curly and straight hair. Stanley is an artist when it comes to hair. His eye for color and precise cuts have brought his clients returning for years. Christine is a certified Great Lengths Extensions specialist. She also specializes in hair-color, highlights, color correction, texturizing and, total makeovers. She does it all! Christine is trained and specializes in Schwarzkopf and Goldwell color systems, as well as Grund Cutting, Keratin Coppola treatments and EasiHair Pro extensions. Her extensive education and training has resulted in her work being published in Passion Stylebooks for up-do’s and color. She’s also been published in Celebrity 101 Hairstyles. Courtney has been with Eclips Salon and Day Spa since 2002. Always having a passion for hair, she eagerly gained her foundation for hair design through the extensive Eclips Apprenticeship Program. With Courtney’s artistic vision and impeccable attention to detail, she enjoys working with her clients and coming up with individualized styles that fit their needs. A master of her craft, she keeps up with the latest techniques and hair trends as they appear on the fashion scene. She strongly believes that continuing education keeps her in the know with all the best hair care and hair design. While she continues to improve her skills and knowledge, she has gained some extensive training from elite educators like Wayne Grund, Gerard Kiernan’s cutting systems, Redken color, Goldwell color, Schwarzkopf color, and L’anza hair care to name a few. She most recently had the pleasure of attending an international hair show in one of the fashion forward cities of the world, Valencia, Spain. Courtney is certified in Coppola Keratin Straightening treatments, and she specializes in highlighting, blondes, razor cutting, long hair styling and special occasion make up. So whether you want a classic cut, a bold new look or contemporary style, you are sure to be pleased with her keen eye and warm embrace. For Courtney, your happiness is what makes her time with you truly worthwhile. Mary McKinney has been a hairdresser since January of 2006, graduating from Graham Webb International Academy of Hair. Mary continues her education and has received advanced training with Redken, Schwarzkopf, L’anza, Framesi, and Paul Mitchell and Goldwell in foil placement, advanced color, hair cutting, highlighting techniques, creative color and special occasion up-do’s. Mary is also a Deva Curl specialist and has been trained to create a customized “Deva Cut” and Deva styles just for those curly haired clients. She is also trained and certified in Great Lengths cold fusion hair extensions and EasiHair Pro extensions. Great Lengths is the leading hair extension company in the industry and its quality is unmatched. http://www.hairuwear.com/great-lengths. She specializes in highlights, low-lights, color correction, ombre, and baylayage. In addition to her talents with styling, Mary is also a make-up specialist and has received exceptional training with MAC. Want to get rid of that brassy blonde color? Needing more dimension? Or just wanting a change? Mary will give you the look you want! She is amazing with up to date hair styles and has a delightful communication style. She is a great listener and understands what you need and want. Kelsey brings a lot to the table. She joined the Eclips team in 2000 after completing Goldwell classes including Color Overture, Trilogy and Advanced Color Technology. She has also taken American Crew Classes in men’s haircutting and design, TIGI Haircutting for Men and Women, and Advanced Haircutting & Styling at Graham Webb Academy of Hair. She specializes in hair color, foil highlights, color correction, haircutting and design for both for women and men. Kelsey is a fun loving, positive and optimistic person; she ensures the happiness and satisfaction of each client! Telisha is an American Board Certified Colorist and has been listed in the Washingtonian magazine as “a choice for hi-lights.” She has extensive training in all aspects of hair design to include cutting and styling, with a specialty in hair color. Telisha started her career in the beauty industry in 1996. Since then she has been trained by top artists with Wella, Schwarzkopf, Goldwell, Framesi, and L’Oreal. Throughout her career, she has organized fund raisers and participated in fashion and hair shows in DC and NYC. With an eye for detail, she is a favorite for men’s haircuts as well. Telisha is passionate about creating the best style for each individual to make them feel their absolute best. Trisha has been a part of the Eclips team since graduating from the Paul Mitchell School in 2009. Trisha loves working with textured or curly hair and has completed her training and certification with the Deva Curl salon in Soho, NY. Trisha also specializes in special occasion hair styles to include weddings, proms and other events. Trisha also specializes in children’s haircuts. She is certified and educated in the Goldwell Color System and loves working with multi-dimensional color. Trisha truly has a passion for making people both look and feel good and enjoys her time with every client. Olivia has been with Eclips since 2013 Olivia specializes in curly hair, highlights, color, balayage and cutting. While trends are constantly changing, Olivia continues taking classes to learn new techniques. She is DevaCurl certified and Keratin certified. Melissa has enjoyed helping others look and feel great about themselves and their hair since 2008. She joined the Eclips team in 2011 and completed the Associates Program under fellow stylist, Linda. Melissa believes continuing education to be vital and necessary to continue working in the beauty industry. To continue expanding her passion for knowledge, Melissa has attended several classes and has earned her certifications in areas such as EasiHair Pro extensions, Schwarzkopf, L’anza and Goldwell color systems, Special Event Hair Design through L’anza, Goldwell, and KMS. Melissa is also certified and specializes in Deva hair cutting and styling, special event styles & up-do’s, children’s cuts and Coppola Keratin treatments. Melissa is a very personable and friendly stylist. She is an excellent listener and also loves to work with children. Melissa truly loves what she does and meeting new people. She always looks forward to providing her clients with utmost satisfaction with their desired look and style. Andy has been a part of Eclips Salon & Day Spa since 2009, after graduating from the Cosmopolitan Hair School in 2008. He successfully completed various apprenticeship experiences and excelled through the Eclips Associate Program. Andy continues his education with passion and has had steady and organized advanced training with widely known schools, including Schwarzkopf, L’anza, Coppola Keratin, Brazilian Blowout, Wella and Goldwell. His talented techniques and precise skill shine in color, highlights and trendy men & women’s haircuts and is also recognized by many. Andy’s special Coppola Keratin straightening skills guarantee to make your hair healthy and shiny. Andy’s most important thing about a service is the communication during consultations that he has with his clients. He is a phenomenal listener and makes all choices based on the clients’ needs and wants. He loves to put his energy and his passion into his work and match his work with the clients’ wanted style. Nawel has been a hairstylist since 2010 and received her cosmetology education at Paul Mitchell - Tysons Corner. Since then, she has taken many opportunities to further her education and skills. She is certified in advanced cutting techniques by KMS, in curly haircuts by DevaCurl, and a Level 2 Master Colorist by Goldwell. She also specializes in keratin treatments for smoothing. Nawel brings her curiosity and creativity to every client experience and enjoys creating a beautiful, unique look for each guest. Tiggy graduated at the top of her class from I.T.S Academy in Dallas, Texas so it’s not surprising that her talent and service quality has been a hit with Northern Virginia clientele she has acquired. With her bubbly personality and passion for hair, she has been able to assist her clients with creating looks that lasts. Paying attention to her client’s texture and lifestyle allows Tiggy to help them achieve a personal style that is easily maintained until they see her again. Certified as a Goldwell Master Colorist, Easipro Hair Extensionist, Devacut stylist, and Coppola and Cezanne Keratin Treatment professional, Tiggy has been able to provide every person who sits in her chair, the hair service that they need to help them get the look they want. Among the many certifications, Tiggy is also trained in eyebrow threading to enhance a client’s look. Tiggy continues to look for opportunities to improve her customers’ experience and hair health by educating herself on the latest trends and products within the beauty industry. Callie's passion for beauty started at a young age when she discovered the joy of making people feel beautiful through hair and makeup. Before joining Eclips, Callie studied at Paul Mitchell the School in Tysons Corner. Along with being a hair stylist, Callie is also a makeup artist and specializes in formal event, wedding, and airbrush makeup. She is certified through Goldwell as a Master Colorist and through Deva Curl for Deva cut and styling, as well as EasiHair Pro extensions and she embraces every opportunity to advance her education in new skills and techniques. Bobbie is gifted with a vision of style for any age. He has enjoyed helping his clients optimize their style as they journey through life. His goal is to build long lasting relationships every day. Bobbie graduated from Paul Mitchell and enjoys doing EasiHair Pro extensions haircuts, color, highlights, balayage and styles for men and women. He stays up-to-date on the latest styles and techniques by attending classes. Sharleen was born with a passion for the hair styling business. Her mother owning her own salon encouraged her into the business. She trained at John Marshall High School in the vocational program and since then, has educated herself with all aspects of the trade. Sharleen loves creating new styles for her clients and works well with fine and curly hair textures. She is certified and specializes in EasiHair Pro extensions, highlights, Schwarzkopf and Goldwell color and Coppola Keratin smoothing treatments. Sharleen’s work has also been published in Passion magazine. 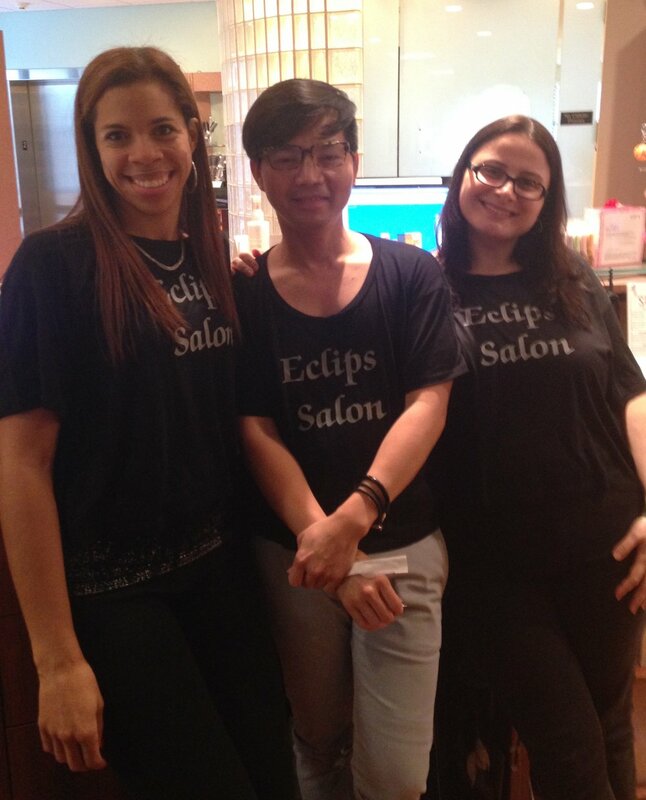 Sharleen brought her experience to Eclips in 1992 and truly enjoys working with this team. She looks forward to another 20 years of sharing her talents and skills with her valued clientele. Gail Has been in the Hair Design Profession since 1972. She has had the opportunity to work and learn with many talented Hair Salons and Spa’s in Northern Virginia and Georgetown, DC. Gail joined the Eclips team in June of 2012. She has completed extensive education with Goldwell Color, L’anza Color, Graham Webb of London and Bumble & Bumble. Gail specializes in cutting and texturizing, perming for curly and textured hair, and coloring to include corrective color. Her clientele includes men, women and children. Gail strives to continue her education to keep her clients happy and excited about their hair. Shahin began her career at Eclips Salons & Day Spa in 1988 after training with several prestigious aesthetic schools in France. Her specialties include skincare, anti-aging facials, and waxing hair removal. She also has a certificate of qualification in Vascutouch, Microdermabrasion and the Sothys Skincare System. Shahin is continually advancing in her education and up to date products by attending frequent training across the United States and Canada. With her dedication and longevity, Shahin is always doing her best to ensure that each and every one of her clients is satisfied with their customized aesthetic and spa services. Recently, Shahin returned from a trip to Paris with Sothys for extended training! She cant wait to treat you with her new Parisian expertise. After over 20 years in the waxing business, Rosario has an easy touch and a quiet demeanor. She is annually certified by the medical, spa and esthetics conference in Montreal, Canada and the International Congress of Esthetics and Spa USA. She was featured in Allure magazine in the Directory of Top Salons for her special hard wax techniques. Rosario specializes in skin care with services such as skin treatments, facial treatments, body treatments, hair removal and specialties in microdermabrasion and using hard wax. Enma has been a licensed and nationally certified Massage Therapist for over 13 years and has been with Eclips since 2002. She is skilled in a variety of massage techniques including Deep Tissue, Swedish, Hot Stone and Pre-natal. She later attended the Esthetic Institute to became a licensed Esthetician and expand her offerings to include skin treatments, facial treatments and hair removal using soft and hard wax. Daniel is one of the most sought-after nail technicians in Northern Virginia. Pay him a visit and you’ll know why. Excellent customer service is his top priority. With over 20 years in the business, he excels in individualized care based on your tastes and his observations. His attention to detail is remarkable, whether it’s a simple manicure, something fancy for a party, brittle nails or any other desire or concern you might have. He listens carefully, lists your options and fulfills your wishes every time with grace and style. Daniel attends educational seminars in this country and abroad to keep up with the latest developments in nail technology and nail products. He updates his services accordingly and explains to you the benefits of certain products and services. He is never pushy but will freely share anything he thinks would be useful for you to know. It’s no wonder that many clients book him at the same time every week to maintain their beautiful nails, or that if they move out of metropolitan Washington, they return for his services anytime they’re back in the area. Pari has been a certified nail technician since 1995 and joined the Eclips team in 2013. Several years after beginning her career, she decided to further her education by studying at the Medical Learning Center. After completing her studies, Pari became an Advanced Nail Technician and earned her certification in Health and Hygiene Care. Pari also continued her education by becoming a certified Reflexologist. She loved learning massage therapy that activated the healing powers of the body. Pari truly loves what she does and loves meeting new clients. Her specialties included traditional, Spa and OPI Gel manicures and pedicures as well as a relaxing reflexology session.